A quick and easy way to disinfect and clean household surfaces. The bleach-free formula cleans and kills 99.9-percent of the bacteria. The wipes can be used throughout the house, kitchen, and bathroom and disposed in trash after use. A quick and easy way to disinfect and clean household surfaces. The bleach-free formula cleans and kills 99.9-percent of the bacteria. The wipes can be used throughout the house, kitchen, and bathroom and disposed in trash after use. A quick and easy way to disinfect and clean household surfaces. The bleach-free formula cleans and kills 99.9-percent of the bacteria. The wipes can be used throughout the house, kitchen, and bathroom and disposed in trash after use. Pre-moistened with cleaners and disinfectants. Use on most hard, non-porous surfaces throughout the kitchen. Bleach free. 7" x 8" sheet size. For use in kitchen and bathroom. Use to clean and disinfect your household surfaces. Kills 99.9-percent germs and odor causing bacteria. Pre-moistened disposable wipes. Micro-Lock fibers. Not recommended for polished or bare wood surfaces. 7" x 8" sheet size. Leaves surface sanitary. Convenient cleaning for all your bathroom surfaces. Use on toilets, sinks, showers and floors. Safe for septic tanks. Made of biodegradable cloth. Kills 99.9% of bacteria and cuts through bathroom grime. Citrus action scent. Use to clean and dust all your hard surfaces. Cleans wood, glass and more. Anti-static formula is great for electronics. Removes dust, dirt, smudges and common allergens from dust mites, pet dander and pollen. Streak-free clean. Leaves no smeary residue. Pre-Moistened. Pre-moistened with cleaners and disinfectants. Use on most hard, non-porous surfaces throughout the house, at work or when traveling. Bleach free. 7" x 8" sheet size. Formulated to clean, polish and protect stainless steel. Designed to resist fingerprints, watermarks, and grease while repelling dust and dirt. Use to clean, condition and protect leather pieces. Rejuvenates leather from shoes to accessories to car interiors with natural oils while providing UV protection. Removes splattered food, grease, oily residue, and watermarks. Leaves a streak-free shine. Recommended for plastic and metal surfaces inside microwaves and glass/ceramic cooktops. Remove grease, grime, water marks and stains from all sealed stone and solid surface countertops. Gives a polished, streak-free shine. Enhances natural color and gloss. Revitalizes dull countertops Recommended for: Sealed stone surfaces including granite, marble, quartz, onyx, travertine, limestone, slate laminate, ceramic, porcelain, tile, fiberglass/any non-porous hard surface countertop. Removes dust, dirt, and fingerprints from screens and accessories. Streak-free. Lint-free. Ammonia-free. Stay Clean Technology makes cleaning stainless steel fast and easy by creating a transparent, protective coating to repel dirt, water and prevent the appearance of fingerprints. Using Magic Stainless Steel Cleaner regularly will keep surfaces shiny, clean and looking like new longer. Pre-moistened with cleaners and disinfectants. Use on most hard, non-porous surfaces throughout the house, at work or when traveling. Bleach free. 7" x 8" sheet size. 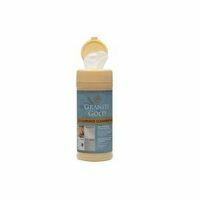 Granite Gold Cleaner Wipe, All Surface, Citrus Fragrance, For Professional and Residential Applications No water necessary. Removes stains including: grease, tar, ink, paint, permanent marker and other hard-to-remove soils. Environmentally friendly and gentle on hands. Contains lanolin, aloe vera & vitamin E. Good for auto, DIY/Contractor, farm environments and more. 10-in. x 12-in. sheets for big spills or messes. A quick and easy way to disinfect and clean household surfaces. The bleach-free formula cleans and kills 99.9-percent of the bacteria. The wipes can be used throughout the house, kitchen, and bathroom and disposed in trash after use.